Psy, who is causing a sensation with his addictive song "Gangnam Style" both at home and overseas, became the first Korean singer to seize the top spot in the U.S. iTunes music video chart on Tuesday. The song that features Psy's now-famous horse-riding dance edged out other famous pop stars such as Justin Bieber (second place), Katy Perry (third), Maroon 5 (fourth) and Carly Rae Jepsen (fifth) to top the chart, which is compiled daily based on the number of downloads. The music video ranked second on Saturday. In this captured video footage from YouTube, Psy shows his horse-riding dance during a baseball game in Los Angeles on Monday. The original "Gangnam Style" attracted 43 million hits as of Tuesday, while the music video for the second version of the song, called "Oppa Is Just My Style" and featuring Hyun-a of girl group 4minute, garnered 13 million clicks, showing Psy's surging popularity on the video-sharing site. While in Los Angeles to discuss possible career options in the U.S. with famous producer Scooter Braun, Psy went to see the Los Angeles Dodgers play on Monday afternoon (local time). 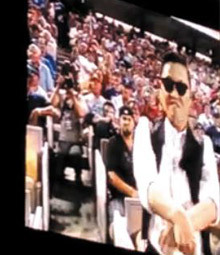 When "Gangnam Style" started blaring over the speakers during a break in play and the video screen showed him sitting in the stadium, Psy demonstrated the horse-riding dance, much to the amusement of the 50,000 spectators. Psy's agency said it was a special event organized by the Dodgers after they learned he would be dropping by to watch the game with Braun.